Australia's Under-19 Men's team, the Emus, completed a clean sweep at the Under-19 Four Nations Tournament in Melbourne today, holding off Spain for a 74-70 win in the final match of the event. Australia’s Brock Motum was named in the tournament All-Star Five and was also named Most Valuable Player after top-scoring in all three games for Australia. In the All Star Five he was joined by Emus’ Vice Captian Cody Ellis, France’s Christophe Leonard, Spain’s Jorge Santana and Greece’s Nikolaos Pappas. The Emus were the only team to escape the tournament undefeated; Greece finished with a 2-1 win-loss record, France 1-2 and Spain 0-3. Momentum see-sawed throughout the final game as first Australia then Spain gained the edge but the Emus did enough in the first and third quarters to hang on for the win, their third of the tournament. Spain and Australia traded baskets in the first quarter before the Emus foul count sent Spain into the bonus situation with over three minutes remaining. But Spain could not capitalise and Australia led 23-16 at the first break. Spain crashed the boards aggressively to chip away at the Emus’ lead and was soon only one point down in the second term. After a Spanish timeout the Emus’ shots stopped dropping until power forward Motum broke Australia’s four minute scoring drought and Ryan Broekhoff drained a three in the dying seconds of the term. Australia held on to a four-point advantage, 37-33, at halftime. The Emus carried their momentum into the third quarter and stretched their lead to 12 points at the final break, 61-49. 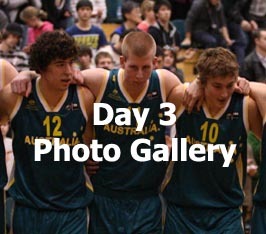 The Spanish started the fourth quarter with a 13-2 run and got back within three points of the Australians. A timeout from Emus’ coach Marty Clarke refocussed his team but Spain were unrelenting. With seven seconds remaining Australia was up 73-70 and a free throw from Emus’ Captain Matthew Dellavedova put the game beyond reach. The win gives the Emus bragging rights going into the 2009 FIBA Under-19 World Championship for Men from July 2-12 in Auckland where they meet Spain in the preliminary rounds, with the possibility of playing Greece and France later in the tournament. Greece overcame their disappointing 96-74 loss to Australia last night by routing France 84-65 in today’s earlier game. Greece was on top from the start, blitzing the first quarter 24-12 and held on for a 19-point win.